Tomatoes are quite well-liked plants to grow nowadays. Their fruits are some of the richest, tastiest, and most nutritious in the world. Not only can they be delicious, but they can also be used in numerous situations. Unfortunately, planting tomatoes can also bring about some problems. They are quite vulnerable to various diseases, infections, and infestations. One of these problems is what we call the ‘Tomato Timber Rot’. In this article, we discuss how to treat tomato timber rot. Furthermore, we discuss how to control and prevent it from happening in addition to anything related to it. 1 What is Tomato Timber Rot? 2 What are the Symptoms and Effects of Tomato Timber Rot? What is Tomato Timber Rot? Tomato timber rot is a well-known deadly fungal disease that affects tomato plants. The fungus responsible for this infection is the organism known as Sclerotinia sclerotiorum. Due to this, the disease is also called Sclerotinia stem rot. Additionally, the fungal infection is also sometimes referred to as the ‘white mold’. This is because of how plants affected by the disease will have white molds in their bodies. According to the Integrated Pest Management website of the University of Missouri, the Sclerotinia fungus likes to grow in places where the temperature is low and the humidity is constantly high. Plants that are wetted with consistently pouring rain are particularly vulnerable to this infection. Because of the growth conditions necessary for the fungus to grow, they usually appear once the tomato plants start to flower. In this period of time, the leaves and flowers start to get dense. They prevent the water from evaporating, consequently keeping the humidity high resulting in possible timber rot infections. High humidity around tomatoes does not only potentially bring about timber rot, but also other types of fungal infections. Blight, for example, is a fungal attack that is worth guarding against. What are the Symptoms and Effects of Tomato Timber Rot? Unless you are paying particular attention to your tomato plants, the symptoms of tomato timber rot may not be too obvious at first glance. The initial symptoms mostly appear on the lower parts of the plant and are generally on the tomato plant’s axils. Symptoms generally appear on moist areas of the plant, thus the lower areas that are farthest from the sun are naturally more vulnerable. The affected parts will eventually get covered by a white substance. The substance is called ‘Mycelium’ which fungi use to decompose plant matter. Over time, the hardened mycelium will appear as tiny black masses that cover the entirety of the tomato plant. Eventually, more and more areas of the tomato plant will get affected by the symptoms. The stems, in particular, will suffer from cuts and wounds. Upon inspecting the wounds or lesions, you will discover that their openings are covered with white molds, and their insides are largely hollow. Tomato timber rot is quite cruel. Once the tomato plant contracts timber rot, its growth will halt, and it will slowly weaken over time. The plant’s leaves will slowly wilt until the plant eventually dies. Before starting the discussion about controlling tomato timber rot, there is unfortunate news for you first. You cannot treat tomato timber rot. Any tomato plant that is infected with this fungal disease is as good as dead already. In this section, rather than explaining how to treat tomato timber rot, the discussion is all about preventing it from infecting your plants in the first place. If the compost pile or soil that you are planning to use is actually infected by Sclerotinia, no amount of effort will save your plant from contracting the fungal infection. Therefore, the very first step you should do is to check that all of your tools and materials for planting are reliable. Choosing the tomato variety to grow may be overlooked, but it is actually a crucial step in combatting tomato timber rot. As you may know already, timber rot often thrives in humid environments. Subsequently, they can easily infect tomato plants with dense foliage. This is because of how low the circulation of air is in compact tomatoes leaves. In this situation, humid air becomes stagnant until it affects the plant. Therefore, if you want to avoid tomato timber rot, planting tomatoes with less dense leaves is a valid choice. For this, you may want to grow indeterminate tomatoes. These kinds of tomatoes often take long to grow, but their foliage is less compact. Meanwhile, determinate tomatoes grow their leaves in a denser way. Fortunately, they are also faster to grow. If you plant them early in the dry season, you should not need to worry too much about tomato timber rot since they should bear fruits before the rainy season begins. Even if you pick non-compact varieties, it would be useless if you are planting numerous tomatoes that are very near to each other. The airflow would still be obstructed and your plants would still be vulnerable to tomato timber rot. A 2-3 feet interval should be enough for compact determinate plants that have a proper caging or support. Larger indeterminate tomato plant varieties may need to be 3-4 feet apart from each other. ‘Maintaining’ in this case refers to making sure that the leaves do not get wild enough and dense enough for it to be a problem. Naturally, you have to properly establish the support system of the tomato plant. Additionally, you also have to prune them regularly so their foliage does not get too thick. The most common way of pruning tomato plants is to simply remove their offshoots. Tomato offshoots are small random shoots that can be usually found growing between a branch and the main stem. There is no harm in doing so, and your plants will benefit from it instead. Whenever you want to shelter your tomatoes from external harm, growing them indoors is always a solid choice. It can be hard if you do not have experience in doing so, but once you get the hang of it, the rewards are definitely worth it. You can plant them in various containers such as pots, hanging planters, raised beds, and more. Growing tomatoes in this way decreases their chances of getting most diseases and not only tomato timber rot. This is only natural since their interaction with nature is significantly lessened as well as with any harmful organisms and substances that exist within it. There is a unique way of growing tomatoes where you would plant them in a growing ting instead of a traditional pot. This is very effective in preventing tomato timber rot since, by using this method, the water should not touch the plant directly upon watering. This means that the humidity in the immediate vicinity of the plant is significantly less than in normal circumstances. The steps that you take after identifying tomato timber rot in your plant are very crucial. If you do not manage the process properly, you may end up spreading the disease to other nearby plants. Here are some things that you can follow to prevent such thing from happening. Once you have identified that a tomato plant of yours have contracted tomato timber rot, it is better for you to give up on it. They cannot be salvaged, and continuing to grow them will only put the rest of the plants in your garden at risk. Therefore, the first thing you should do is to pull the infected plant up completely, not leaving any dead plant matter in its wake. Even the roots and some soil that are in contact with the plant should be completely removed to be safe. Once you have removed the plant, you should obviously not put any of it in the compost pile. Instead, there are two things you can do to dispose of it – bury it in the ground or burn it. This is the most effective method that you can apply after pulling up the plant. Once you burn it entirely, you should have been able to dispose of it while not allowing the fungi to spread. This method is recommended if you have no qualms of doing such an act. However, in some cases, you may not want to burn the infected plant. For instance, in some places, burning things like this may be prohibited by the law. Obviously, you cannot burn anything if it’s illegal. Additionally, burning is technically bad for the environment. So if you are one of those people who want to be as eco-friendly as possible, you may also want to skip this process and do the alternative instead. If for some reason, you cannot burn the remains of the infected plant, you can bury them instead. As long as you bury it in the ground that is far away from your garden, it should not affect you whatsoever. If you can, bury the remains deeply. However, you should be careful to remember where you dump the thing. Additionally, you have to make sure that that patch of soil that you dumped it on will not be used to plant anything anytime soon. Unfortunately, there is no specific product that will miraculously allow you to avoid or eradicate tomato timber rot completely. However, there are some products that will help you prevent them in accordance with the tips presented. In this section, we list some of the said recommended products. You may not need all of these, but they are worth considering. The first product in this list is a combination of two important parts in preventing timber rot – the pot, and the support system. If you want your plants to be slightly spread out to circulate air, you will need a proper support system. Not only does a support system control the foliage, but it also isolates the tomatoes to prevent spreading of diseases in case of emergency. Additionally, if you plan on growing tomatoes indoors, you will need a container. 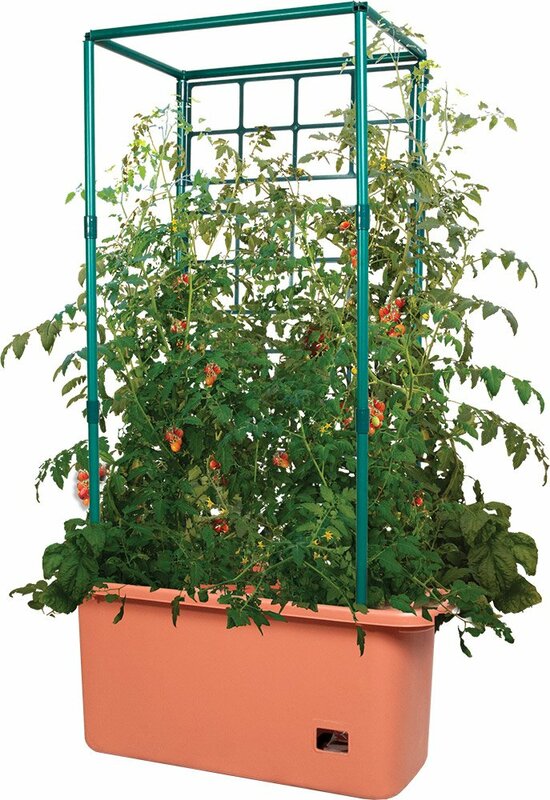 The Hydrofarm Tomato Trellis with wheels is very convenient since it offers both. You will not need to buy two different things separately. In addition, the thing is large which makes it perfect for growing indeterminate tomatoes. You do not have to worry about the weight either since it has wheels to help you move it around. As mentioned before, you can also grow your tomatoes in growing rings. This is especially true if you don’t like growing them inside your house. The Opyla Watering Pots are conveniently-designed growing rings that are also durable and high-quality. Each of these watering pots has a watering trough and three holes that are used to erect stakes. If you want a method that requires less effort but still effective, planting tomatoes in growing rings while using Opyla Watering Pots should be a great choice. If you are a new and inexperienced gardener, and you are afraid of your plants contracting tomato timber rot, why not try planting mini tomatoes? Mini tomatoes, as their name imply, are tiny tomatoes that grow fast. They are less vulnerable to various diseases, and they also require minimum effort to grow. Even if they somehow die due to the fungal disease, you will not lose too much and you will not waste too much effort. The Tiny Tim Tomato is a variety of mini tomato. Since they are so tiny, you can basically plant them anywhere as long as they have enough soil, water, and sunlight. 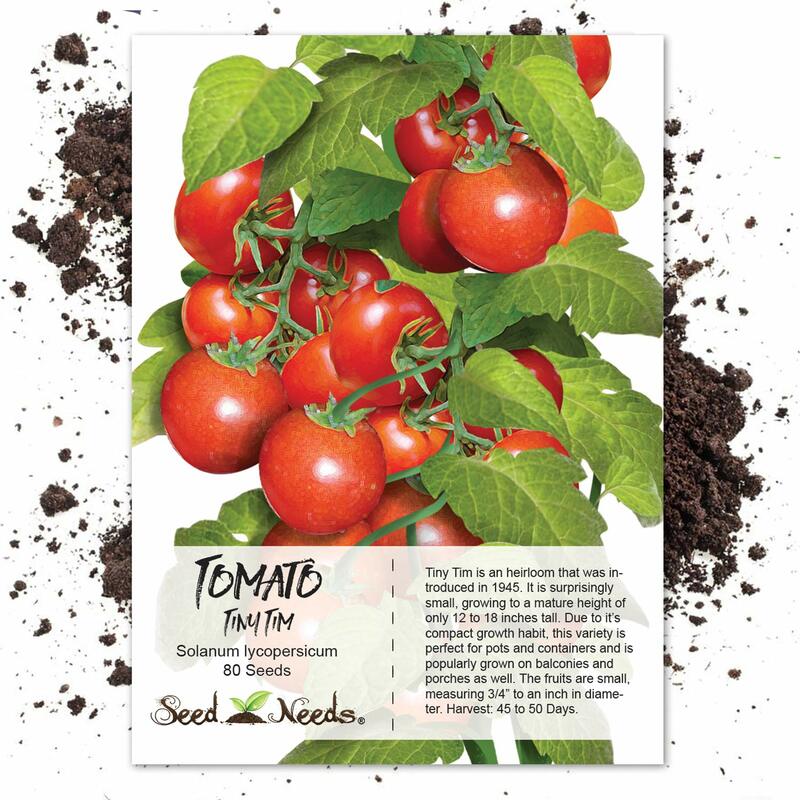 Tiny Tim tomato plants can grow to 12 inches tall only. However, that can already be considered tall when compared to some of their mini tomato cousins. Their leaves can also be more spread out than the others, which is a good thing. Tomato timber rot is a very cruel disease that affects tomato plants. Fortunately, we are not entirely clueless anymore on how to treat tomato timber rot. You only need to follow the utmost care whenever you plant and grow your tomatoes. If you do the steps properly, you should be able to control tomato timber rot from harming your plants.